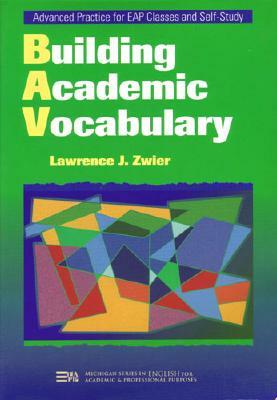 "Building Academic Vocabulary" was written because English for Academic Purposes (EAP) students often complain that they don't have the vocabularies they need for college courses. "Building Academic Vocabulary" will help students develop lexical precision as they work in such often exercised modes as cause-effect, general description, description of processes, or comparison/contrast. Each unit focuses on 10-15 key vocabulary items within a certain essential meaning area. Each unit also highlights--and lightly exercises--20-25 additional vocabulary items that provide a broader and more diverse second level of learning. The nine meaning areas addressed were carefully selected for their usefulness in the writing and speaking most common in EAP classes. Similarly, the comments about usage and syntactic restrictions in the text have been referenced to two widely used corpora. "Building Academic Vocabulary" is usable as either a self-study tool for advanced students (or professionals eager to refine their English) or as a course book. It makes an excellent supplement to a course or text that focuses on rhetorical modes, either reading or writing. Author Name: Zwier, Lawrence J. Description: illustrations 243 "Building Academic Vocabulary" was written because English for Academic Purposes (EAP) students often complain that they don't have the vocabularies they need for college courses. "Building Academic Vocabulary" will help students develop lexical precision as they work in such often exercised modes as cause-effect, general description, description of processes, or comparison/contrast. Each unit focuses on 10-15 key vocabulary items within a certain essential meaning area. Each unit also highlights--and lightly exercises--20-25 additional vocabulary items that provide a broader and more diverse second level of learning. The nine meaning areas addressed were carefully selected for their usefulness in the writing and speaking most common in EAP classes. Similarly, the comments about usage and syntactic restrictions in the text have been referenced to two widely used corpora.